Every online casino offers a deposit bonus. For example, if you deposit $500, you may get an additional $500 to play with. But it isn’t exactly free money, because it comes with strings attached. Conditions: You need to wager 100 times this amount to make a withdrawal. Conditions: You need to wager 5 times this amount to make a withdrawal. A $1,000 bonus may seem great, but if you have to wager 100 times this amount just to be able to withdrawal your funds, that means you’ll need to have wagered 100 x $1,000 = $100,000. By that time, you will have lost all your bankroll, and $1,000 would be comparatively nothing. But with casino 2, the modest bonus of $100 is a much more reasonable offer because you only need to wager $100 x 5 = $500 to make a withdrawal. Of course the bonuses have limits. So you can’t just deposit $100,000 and expect a $100,000 bonus. The best casino comparison site is www.latestcasinobonuses.com which conveniently lists the bonus, the maximum bonus, and the conditions for withdrawals. Bonuses are optional. Casinos will ask you whether or not you want to accept them, but keep in mind they have strings attached. I’ve received many complaints from players who are refused payouts because they agreed to the fine print when accepting a bonus. But this is expected behavior from the casino. It is not cases where you win loads of money and the casino says something like they suspect you of using a bot, and they outright refuse to pay you. 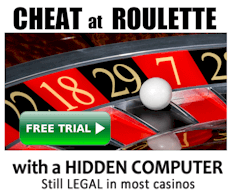 Certainly there are lots of dishonest casinos around, so it is important to research which are reputable. 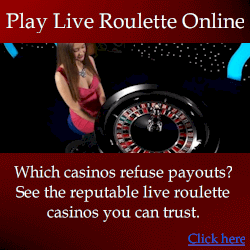 Websites like the one mentioned above have large forums where the credibility and behavior of casinos are discussed. And you can be sure that a player has been treated unfairly, that the word will spread, and the casino will lose far more in potential revenue because of the bad publicity. When shouldn’t you accept a bonus? Generally for professional play, I wouldn’t advise accepting casino bonuses. This is because what you win is not limited by what is possible. It is more limited by what the casino will allow you to win, before they take action. And action is only rarely outright banning you. It is usually applying countermeasures which may not make you lose, although can. It is more that they make life more difficult for you. It depends on the system you are using, but for my system explained at roulettephysics.com, countermeasures mostly increase the time you need to dedicate. Professional online casino players frequently change accounts, so that no single account wins a suspicious amount. And while you may have a long term advantage, you may find you have an extra good run of luck very early on. So it would be wiser to just take those winnings, and move to the next account. But if you have accepted a bonus, then you wouldn’t be permitted to do this. So in this case a bonus will limit your options. When should you accept a bonus? For the vast majority of players, there is no reason why you shouldn’t accept a bonus. Let’s say you deposited $100 and got a $100 bonus, but needed to wager $500 to receive it. For the average roulette system, which unfortunately has no long term edge, all you ultimately do with the bonus is decrease the edge against you, at least from the perspective that if you are going to wager a certain amount of money, then you would be better off with the bonus instead of without it.